The Murcia region of Spain is a SpoCOOL Favorite, be it for their cheeses -- Drunken Goat is still available at Main Market -- or their salads. 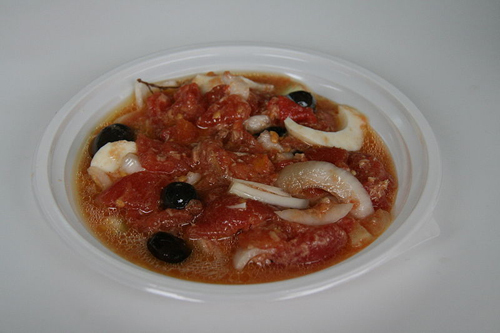 We enjoy moje, more commonly known as ensalada murciana, or just Murcian salad for the rest of us, a tomato and olive oil heavy salad that is easy to make at home. Cut the tomatoes into small chunks, and put them (juices and all) in a bowl alongside the finely chopped scallions. The olives can be added whole (as long as they're pitted, obviously) or more finely chopped. We prefer to chop the eggs up a bit and add them here, but they can also be used as a topping (usually in halves or quarters). Throw in the drained tuna, then pour in the olive oil, and stir the contents of the bowl. Make sure everything gets mixed well together, the oil should coat everything. Add salt to taste -- a good pinch will do. We'd recommend serving the moje with a good crusty bread and a lighter beer, like Oskar Blues's Mama's Little Yella Pils. Do you recommend Moje? Make your voice heard!